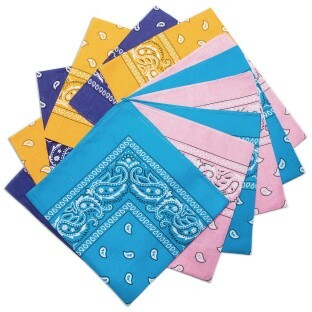 21-1/2" square 100% cotton bandanas in classic paisley design. Includes 3 each of 4 colors: Pink, Yellow, Blue and Purple. Bandannas - Fashion Colors. 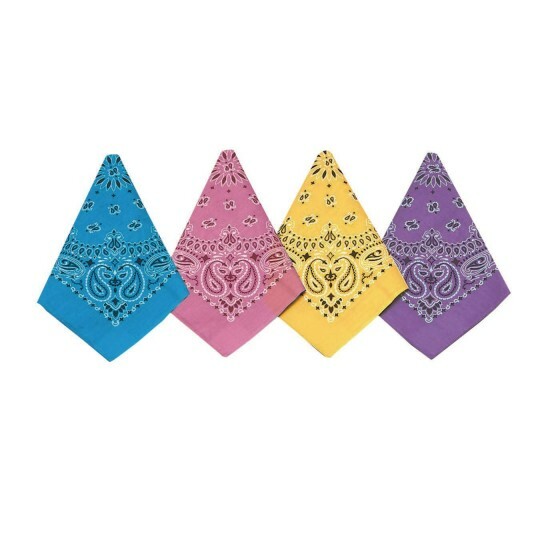 21.5" square cotton blend bandannas in assorted fashion colors with classic paisley design. Used these for our Hoe-Down event. Kids loved them! These were exactly as I expected - I got a bunch for a community run to make my runners stand out and it definitely worked. Most girls wore their bandannas for the entire walk as they were lightweight enough as well. At Girl Scout Camp the girls are requited to always have a bandana with them. We are folding the bandana as to place it on our head and then cut a number of strips on the end beading three beads to two strips.I couldn't find the beads needed until I check your website. It was so much easy purchaning the beads and bandanas at the same time and place.